The objective of this lab is to gain a fundamental understanding of the MatLab[TM] application. This will be accomplished by applying various simulation techniques. Simulation is necessary as the circuits themselves are too complicated to be realized reasonably. 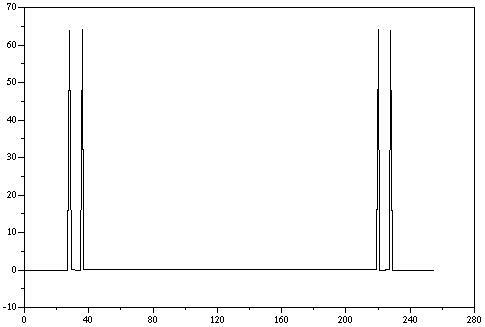 1)	PC with MatLab[TM], octave, or SciLab installed. 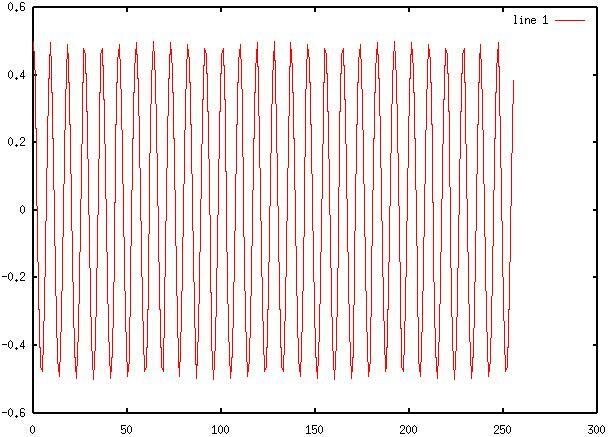 2)	Create a second signal in the same manner with f=32Hz, and plot both using "plot(t,x,t,y)"
3)	Create a new function, z(t) = x(t)*y(t) by using "z = x. 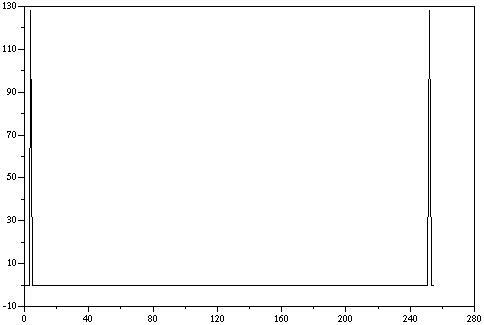 *y;"
5)	Using the fft function, plot the spectra using X(1:256) to display the spectra of x(t), y(t), and z(t). 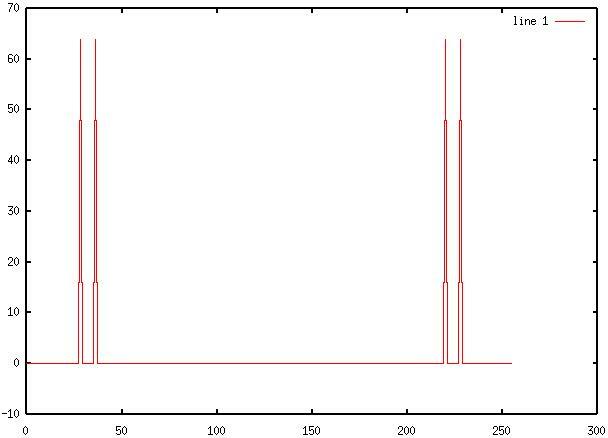 6)	Justify that the spectra are correct. 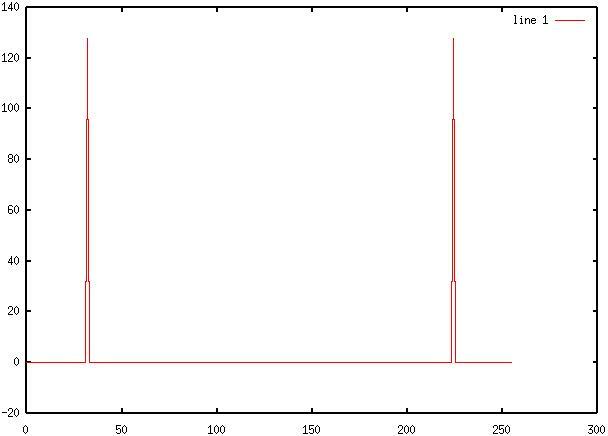 8)	Set the 37th and 221st sample of the Z array to zero. 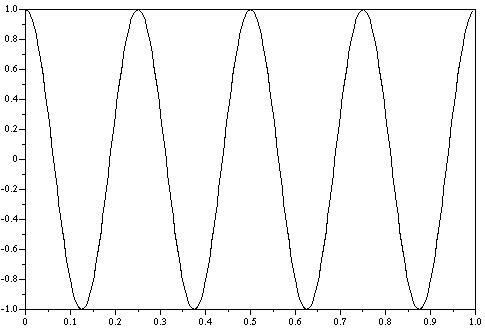 9)	Explain what effect this has on the signal. 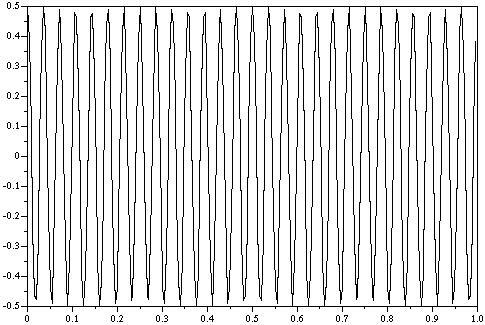 10)	Using the command "z=real(ifft(Z));" plot the filtered time domain function. 12)	Find the dot product between x(t) and y(t) using "xy = x*y'"
13)	Justify the value produced, and determine if the functions are orthogonal. 14)	Find two functions that are orthogonal to x(t) and have the same frequency as x(t). 15)	Verify, using the program, that the functions are, in fact, orthogonal to x(t). 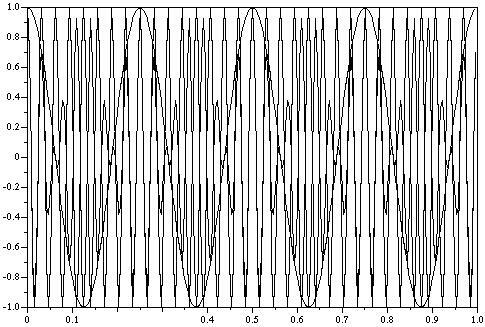 3)	Diagram 3:	SciLab output for combination of 32Hz and 4Hz sinewaves. 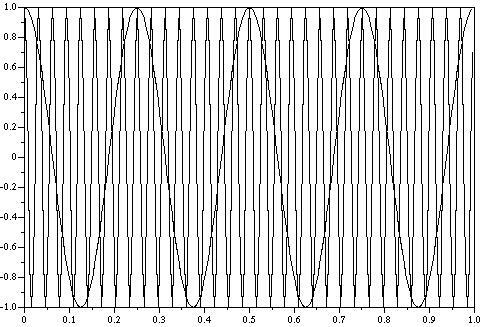 4)	Diagram 4:	Octave output for combination of 32Hz and 4Hz sinewaves. 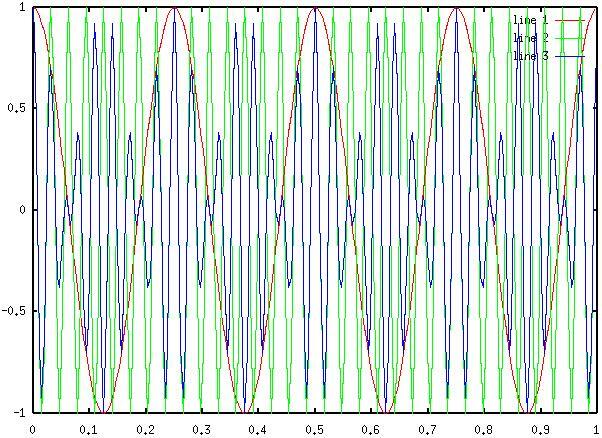 5)	Diagram 5:	SciLab output for 32Hz sinewave, 4Hz sinewave, and the resulting waveform of the two multiplied together. 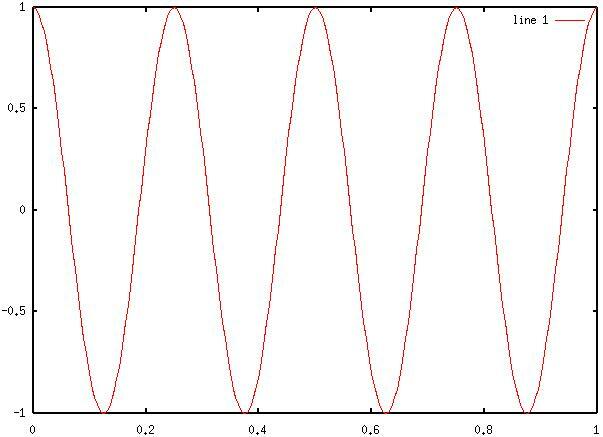 6)	Diagram 6:	Octave output for 32Hz sinewave, 4Hz sinewave, and the resulting waveform of the two multiplied together. 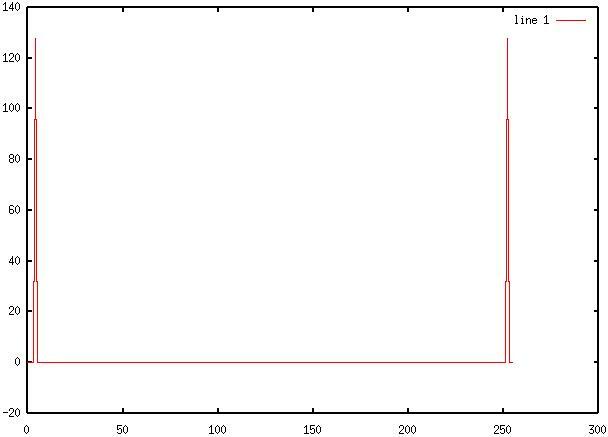 1)	Q:	Find the exponential Fourier series of x(t), y(t), and z(t), how do they compare to X, Y, and Z? 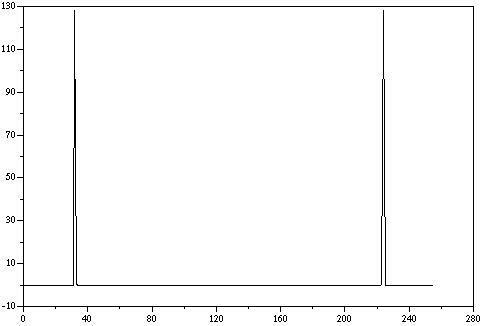 A:	x(t) = 1v @ +/- 4Hz - The spectra is correct except for the amplitude; y(t) = 1v @ +/- 32Hz - The spectra is correct except for the amplitude; z(t) = 1v @ +/- 28Hz, 1v @ +/- 36Hz - The spectra is correct except for the amplitude. 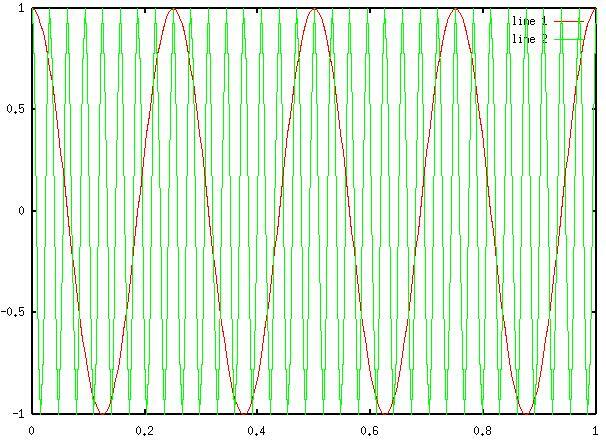 2)	Q:	Given an 4Hz squarewave and a 8Hz sinewave, how could MatLab be used to prove that they are orthogonal, prove it analytically. 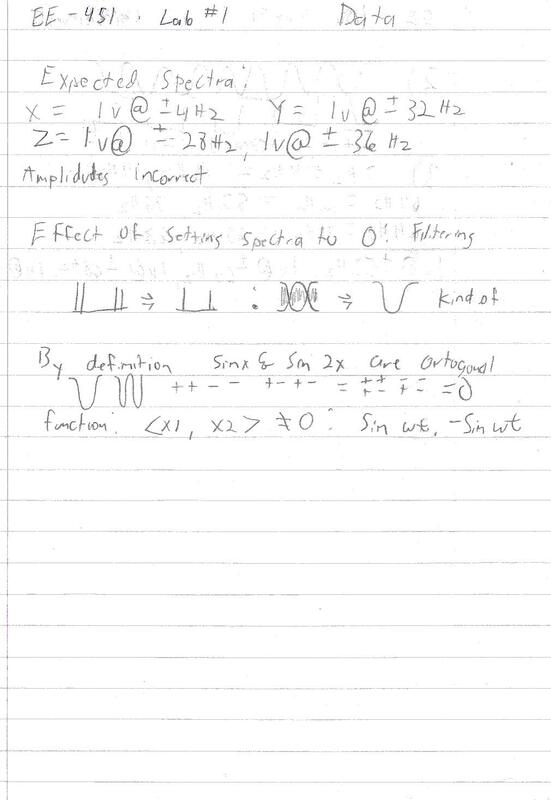 A:	Simulate the waves using a -1^n exponential series for the squarewave, and the cosine directly for the sinewave. 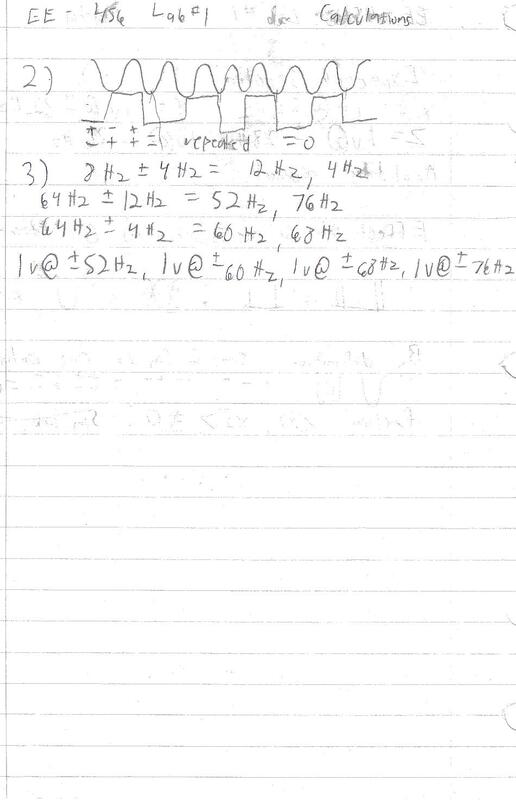 Use the operator "xy=x*y'"
3)	Q:	Given sinewaves of 4Hz, 8Hz, and 64Hz, find the spectrum of the product of the waves. This lab has demonstrated the basics of the MatLab command set. I do not have the ability to run MatLab on any computer, so instead, I chose to run a combination of SciLab and GNU Octave. I found that the Octave had more inherent variables (pi, etc) and was slightly more accurate, and had syntax closer to MatLab, but SciLab had a lot more functions, including those that interfaced with the system DSP. For the exact command structure, please refer to the attachments.
! - 0.0025193 - 0.0025220 + 9.167E-08i - 0.0025302 + 1.839E-07i !
! - 0.0025440 + 2.772E-07i - 0.0025636 + 3.721E-07i !
! - 0.0025892 + 4.693E-07i - 0.0026212 + 5.695E-07i !
! - 0.0026601 + 6.733E-07i - 0.0027064 + 7.816E-07i !
! - 0.0027609 + 8.954E-07i - 0.0028246 + 0.0000010i !
! 0. 0.0039062 0.0078125 0.0117188 0.015625 0.0195312 !
! 0.0234375 0.0273438 0.03125 0.0351562 0.0390625 !
! 0.0429688 0.046875 0.0507812 0.0546875 0.0585938 !
! 0.0625 0.0664062 0.0703125 0.0742188 0.078125 !
! 0.0820312 0.0859375 0.0898438 0.09375 0.0976562 !
! 1. 1. 1. 1. 1. 1. 1. 1. 1. 1. 1. !
! 1. 1. 1. 1. - 1. - 1. - 1. - 1. - 1. - 1. - 1. !
! - 1. - 1. - 1. - 1. - 1. - 1. - 1. - 1. - 1. - 1. - 1. !
! - 1. - 1. - 1. !